Discover the effects of foods and nutrients on your gene expression! Nutrigenomics or Nutritional Genomics is the study of the effects of foods and food constituents on gene expression. Scientists have discovered that our genes are in fact “switched on” or “off” by the foods we consume, exercise and lifestyle choices. Nutrigenomics has received much attention recently because of its potential for preventing, mitigating, or treating chronic disease, through specific and influential dietary changes. The degree to which diet influences the balance between healthy and disease states depends upon an individual’s genetic makeup. Dietary changes based upon knowledge of individual nutritional requirements, nutritional status, and genotype provides a very detailed and specific blueprint for personalised wellness! For example, scientists have discovered, that depending upon your genetics you may respond better to different diets; where one person may benefit from less carbohydrates but more fats and protein, others may not. One of the most important recent discoveries is how food choices actually change your gene expression in real time and amazingly only over the course of a few months! Nutrigenomics also takes the guess work out of which nutritional supplements are actually beneficial for you personally, and which ones are not. You will be provided with an easy-to-use test kit to collect a saliva sample that is sent to a laboratory in Australia to be sequenced and analysed. A few weeks later a 100 page lab report is returned to us as your personalised genetic profile. 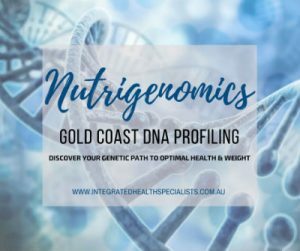 Our Nutrigenomics practitioner will then interpret the results and provide an easy-to-follow personalised lifestyle plan and book you in for your consultation (either in person or via Skype) to share the findings; identifiying what types of exercise, foods and nutritional supplements will benefit you the most for optimal health and weight. To find out more about this amazing DNA testing process please click here. CHECK OUT WEIGHT LOSS & WELLNESS PROGRAMS NOW!